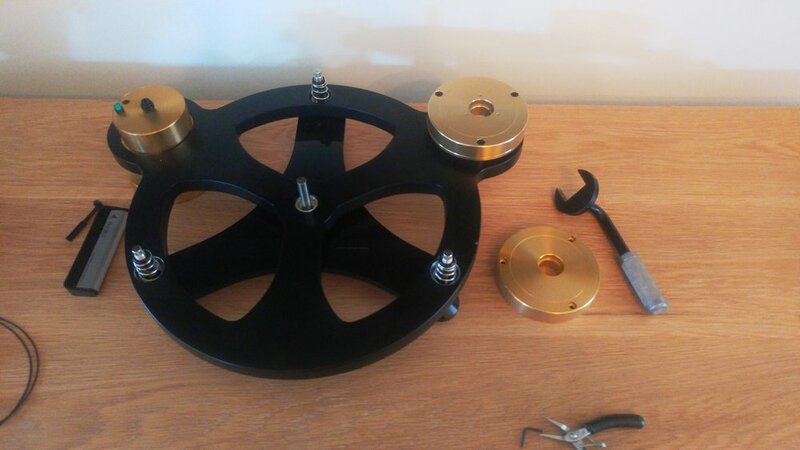 Christmas arrives a little early for one of our customers as he has treated himself to a new tone arm on his Michell Gyro turntable. 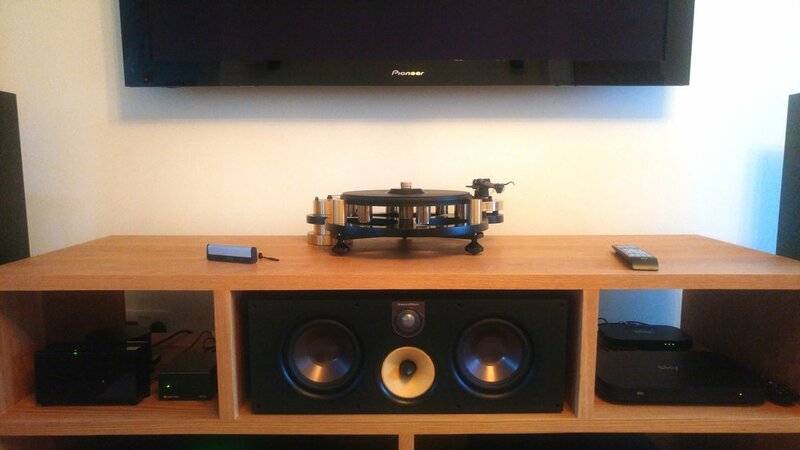 He had an ageing Rega RB300 previously installed on the turntable that was starting to become troublesome. With our advice the customer chose the obvious choice, the Michell Techno A tonearm in black to match the existing finish of the turntable. At the same time we have also removed the old acrylic plinth and lid giving the deck a much slicker look and feel. This was achieved by adding the Michell Gyro Spyder kit as shown below. The old deck is dismantled and the feet are removed from the plinth and threaded on to the new Spyder. The old arm mounting plate needs to be replaced as it is the single mounting point plate. The new mounting plate is seen fitted in place above. The new three point mount all ready for the new tone arm. Next we need to fit the cartridge to the tonearm. 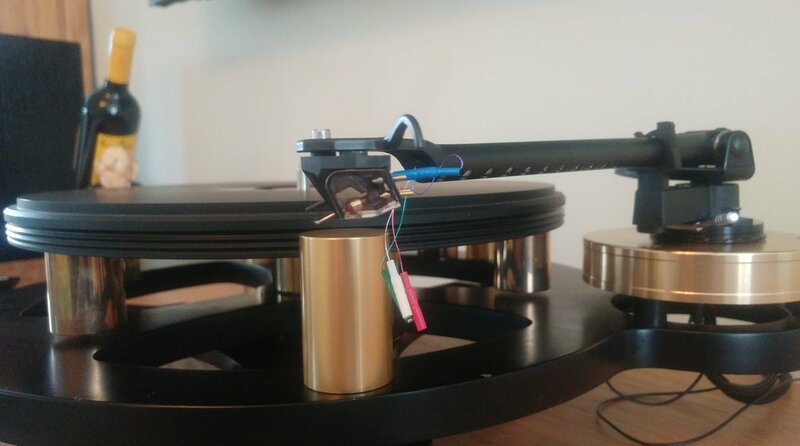 Our customer decided to go for the Rega Ania MC cartridge as shown below. Now we need to adjust the height of the tonearm to make sure the vertical tracking angle is correct for the cartridge installed. This is achieved by the clever Michell thread at the mounting of the arm. 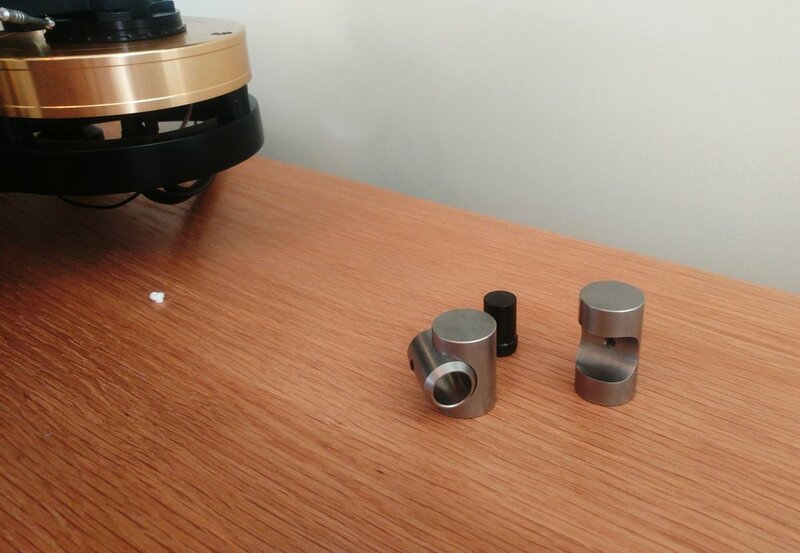 In this case no adjustment was needed so the three mounting screws can tightened to fix the tonearm in place. Two different weight scallops are supplied depending on the weight of your cartridge. In this case the larger of the two has been used. Above we are checking the tracking weight using Project Measure IT stylus balance gage. Above is the is older Michell HR power supply (this has now been replaced with a more modern looking box and case work) alongside the Nytech CDP122, our weapon of choice at the moment when it comes to supplying moving magnet or moving coil setups. 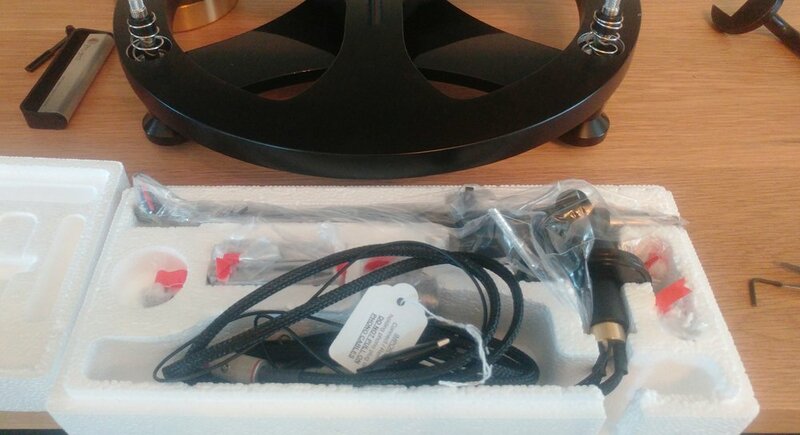 Thanks to Steve for his permission to blog about his latest audio upgrade. In the pic above we have the front of his home cinema setup. The classic Pioneer plasma, Arcam AVR550, REL S3, Oppo UDP-203 & the now discontinued Bowers & Wilkins 683S2 teamed with the HTM61S2 center speaker. He finishes off his surround system with two B&W M1 speakers on the rear and B&W CCM665 in the ceiling for Dolby Atmos, creating a very impressive 5.1.2 system. 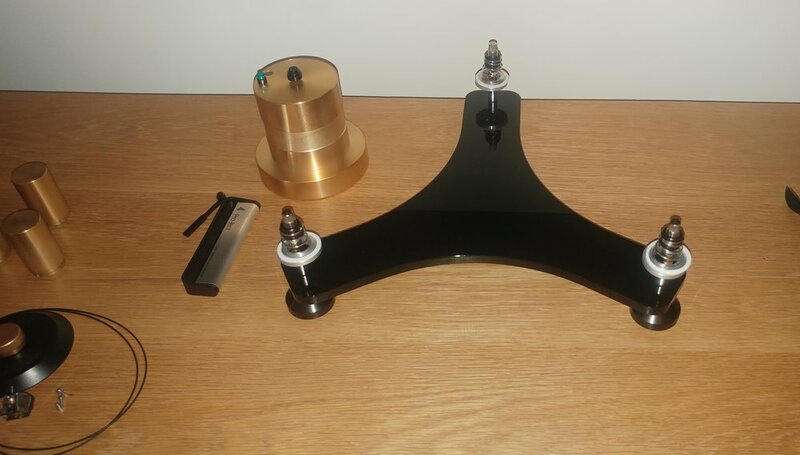 Michell Techno A arm and Rega ANIA MC cartridge is available from all branches of Audio T.
Thanks for reading: Hefin, Nick (blogger) and Kerrin Audio T Cardiff. 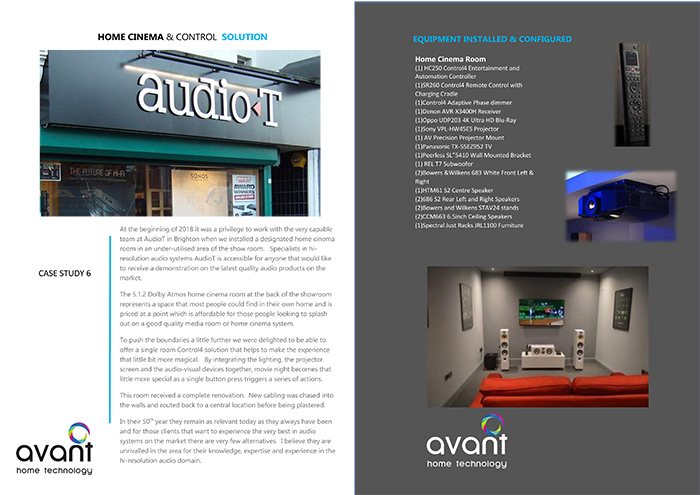 It was rather fortuitous recently to be approached by Mark Packham of Avant Home Technology, with a view to collaborating on Home Cinema, Custom Install and Home Automation, as we were looking for such a partner here in Brighton, to cover the City and wider area where we operate. Indeed the first project Mark tackled was our Home Cinema Room in store, and what a fine job he has made of it! The aim was to showcase a fully automated room offering outstanding sound quality with a projector and screen as well as 4K TV, and at a reasonable cost. This system can be scaled up or down in cost according to the customer requirements, with automation incorporating many aspects of the home if required, to the extent of lighting, CCTV cameras, electric gates, and much more besides. To experience this system for yourself and explore the possibilities of Home Cinema, Custom Install and Home Automation please contact us on 01273 609431 or email us at: brighton@audio-t.co.uk where Julian, Paul and John will be pleased to help you. We are able to visit you at home to discuss projects and in particular Mark Packham is available for these visits. The Case Study below put together by Mark gives a general overview of the system. At the beginning of 2018 it was a privilege to work with the very capable team at Audio T in Brighton when we installed a designated home cinema room in an under-utilised area of the show room. Specialists in hi-resolution audio systems Audio T is accessible for anyone that would like to receive a demonstration on the latest quality home audio products on the market. The 5.1.2 Dolby Atmos home cinema room at the back of the showroom represents a space that most people could find in their own home and is priced at a point which is affordable for those people looking to splash out on a good quality media room or home cinema system. To push the boundaries a little further we were delighted to be able to offer a single room Control4 solution that helps to make the experience that little bit more magical. By integrating the lighting, the projector screen and the audio-visual devices together, movie night becomes that little more special as a single button press triggers a series of actions. This room received a complete renovation. New cabling was chased into the walls and routed back to a central location before being plastered. After over 50 years trading Audio T remain as relevant today as they always have been and for those clients that want to experience the very best in audio systems on the market there are very few alternatives. I believe they are unrivalled in the area for their knowledge, expertise and experience in the hi-resolution Hi-Fi audio domain.